Archaeology of alcohol: Ancient beer, wine, mead, some made at Dogfish Head. How archaeologists recreate ancient booze. Phrygians were brewing with barley before it was cool. Resurrecting ancient beers and wines is a subtle alchemy, but Patrick McGovern knows all the tricks. He directs the Biomolecular Archaeology Project for Cuisine, Fermented Beverages, and Health at the University of Pennsylvania Museum. Many of his ancient brews are sold by Dogfish Head brewery in Delaware. How did you start making ancient drinks? One of the first we made was the Midas beverage, based on residues in bronze vessels recovered from the Midas tomb in Turkey, which dates from 700 B.C. These pointed to an unusual drink combining wine, barley beer, and mead. There were also food remains in the tomb that suggested a barbecued lamb or goat stew with lentils and spices. We tried to recreate the funerary feast as a way of bringing the past to life. How do you go about recreating a drink? People give me either samples of pottery or residues from ancient vessels possibly used for making, storing, or drinking a fermented beverage. 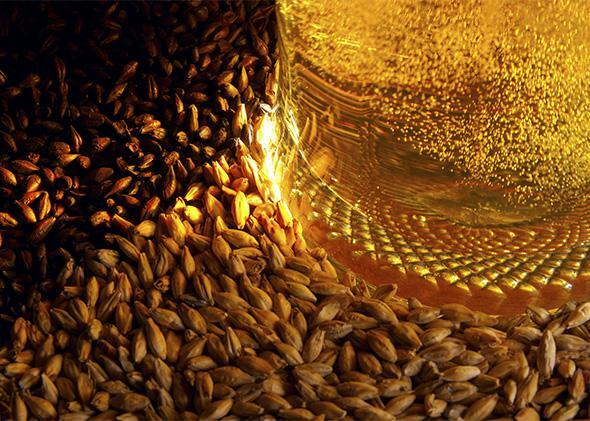 I identify the markers of specific natural products: Tartaric acid is a fingerprint compound for grapes in the Middle East, for example, while calcium oxalate points to the presence of barley beer. What did the Midas beverage taste like? We knew the three basic components—grapes, barley, and honey—but we didn’t know what the bittering agent was. It couldn’t be hops, as they only became available in Europe around 700, so we looked at the eastern Mediterranean spices that would have been available: saffron, cardamom, bitter vetch, cumin. In a competition among microbreweries to recreate the beverage, Delaware-based Dogfish Head used the best-quality saffron as their bittering agent, as well as Greek honey made from thyme blossom. Their winning beverage was on the sweet side, but the saffron gave it aromatic properties. How does ancient booze compare with the modern stuff? Ancient beverages tended to be much more multidimensional. People didn’t necessarily specialize in one beverage; the wine industry was inseparable from the beer and mead industry in the earliest periods. Also, they wanted to be sure they had enough sugar to get the fermentation going, so they took whatever they had that contained sugar and mixed them together. Which of your recreations would you pair with a traditional turkey roast? The turkey is an American bird, so I’d propose having your English Christmas dinner with our American ancient ale, Theobroma, which was recreated by chemical analysis of pottery fragments from Honduras, dated to 1400 B.C. Its cacao aroma will go nicely with the bird, a bit like a chocolate mole over chicken, a Mexican favorite. 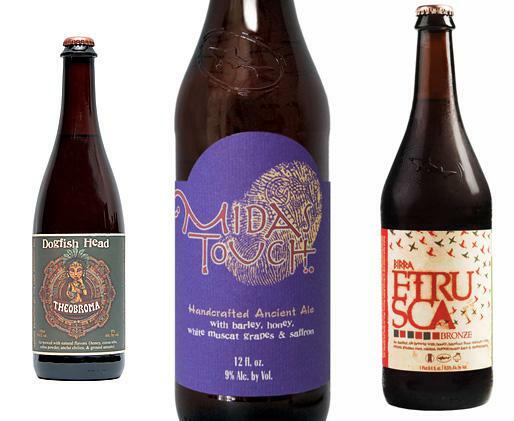 Dogfish Head’s Theobroma, Midas Touch, and Etrusca. Photo illustration by Slate. Product photos via the manufacturer. What about for a beach barbecue? If you were barbecuing fish or shrimp, I’d go for Midas Touch. It’s a little like white wine, and it has delicious, piquant qualities which I think would go well with fish. For barbecued steak, I’d go for our early Etruscan ale, Etrusca, whose recreation is based on evidence from 2,800-year-old tombs in central Italy. Its backbone is malted heirloom barley and wheat, but it also has hazelnut flour and pomegranate, which would be a good match for the beef. It even contains myrrh, for an added Christmas motif.